With a stay at Bo Xue Lou Hotel in Shanghai (Xuhui), you'll be within a 15-minute drive of Jing An Temple and Old Chinese City. Free self parking is available onsite. When you stay at Xiongfei Jinxiu Garden Hotel in Zigong, you'll be 14 minutes by foot from Zigong Salt Museum. Self parking (subject to charges) is available onsite. With a stay at Dazhan Home Inn in Weihai, you'll be 31.4 mi (50.5 km) from Weihai Marine Park and 31.6 mi (50.9 km) from Jinhou Shopping Mall. Free self parking is available onsite. With a stay at Xinyue Bay Inn- Xitang in Jiaxing, you'll be 11.7 mi (18.8 km) from Shanghai Puji Bridge and 14.6 mi (23.5 km) from Shanghai Grand View Park. 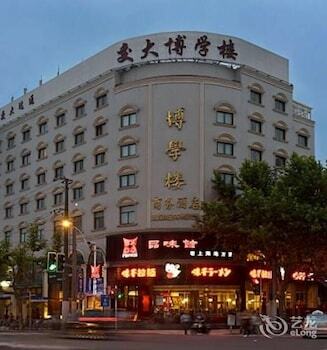 With a stay at Super 8 Hotel in Jinan (Shizhong), you'll be within a 15-minute drive of Daming Lake and Daming Hu. Featured amenities include luggage storage and an elevator (lift). With a stay at Mai Xin Ge Boutique Inn in Shanghai (Pudong), you'll be within a 15-minute drive of Shanghai Tower and The Bund. Free self parking is available onsite.